buckwheatnoodspeanutsauce, originally uploaded by veggiebytes. This is a fast staple in our household and so good for everyone. 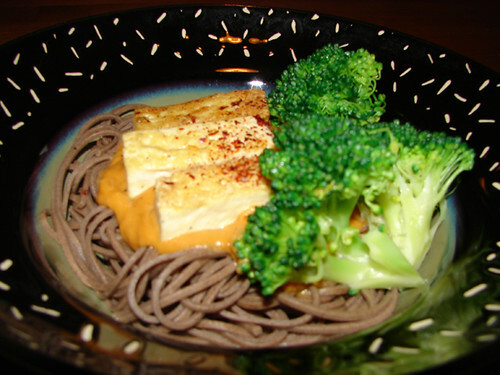 The buckwheat noodles cook fast and are a nice Asian alternative to having spaghetti all the time. The Pumpkin/Peanut sauce is something that I know by heart now, but the idea originally came from Vegan Family Favorites. You basically take some sesame oil and sautee minced garlic or hing, about 1 tbsp fresh grated ginger, then add about 1/4 cup peanut butter. Add about 1/2 can of pumpkin puree (NOT Pumpkin Pie Mix! ), about 2 TBSP Braggs, and 1/2 cup to 1 cup of water, depending on how thick you want it. For dad or mom, you could add some chili oil for spiciness and leave it out for the little ones. We fried some tofu to add and steamed broccoli to add the “green” component. It’s a nice filling dish and a great way to get Vitamin A from pumpkin throughout the year.